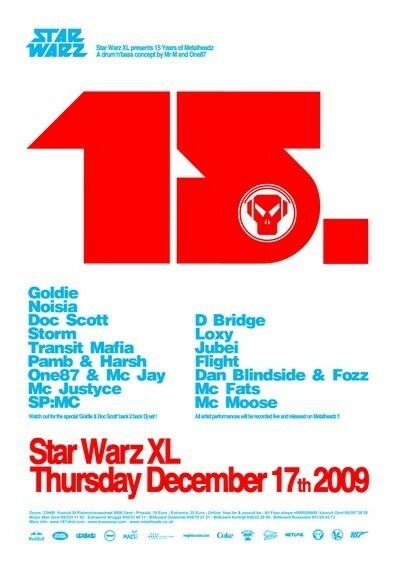 It’s no secret that Goldie is a big fan of Star Warz. He has played for Star Warz a number of times and always has a great time. But for him to choose this party as thé party to celebrate the 15th anniversary of the biggest and most influential Drum ‘n’ Bass label ever is another honor. Because, for this special occasion, all the sets will be live recorded to be released officially on Metalheadz later! And on top of that, Goldie will bring an exclusive 3 hour back-to-back set with Doc Scott from 31 Records, the man with whom he originally founded Metalheadz and who he likes to call ‘the King of the Rollers’. He’s also bringing a lot of other producers and dj’s from his label as DJ Storm who was responsible for A&R and press at the start of Metalheadz and is currently resident, promoter and programmer of the Metalheadz Sunday Sessions in London. From Holland hails the wonder trio Noisia who next to several 12” for Metalheadz have been asked to remix the biggest names in music and deliver music for Playstation’s Wipeout series. Not without losing their touch with the Drum ‘n’ Bass scene as they are to be found on all the major labels from the scene. Long-term Metalheadz MC’s Justyce and SP:MC will liven up the sets in a way that they only can. In the main room the Metalheadz crew will be joined by Transit Mafia from the UK, Pamb and Harsh from the Major League Events in Holland and resident & promoter of Star Warz One87 who will now be joined by MC Jay. In the second room, D-Bridge from long time Metalheadz fame and off course his own Exit Record label will lead the way. He will be joined on his journey into sound by other Metalheadz members as Loxy, not only a resident for Metalheadz but also for Renegade Hardware and Theraphy and running his two labels Cylon and X-tiction Agenda. DJ Flight has been a Metalheadz resident for 10 years now as well as a resident for Fabio’s Swerve night for 9 years. Next to lots of co-productions, she also runs her own label Play:Musik. And Jubei is a bit of a newcomer on Metalheadz who got signed for a 12” after Goldie enlisted his talent to engineer his orchestral piece ’Sine Tempus’ for the BBC Proms and ‘Classic Goldie’ TV show. Together with Dan Blindside and MC’s Fats, Moose & Fozz they are all sure to bring the roof down !